The Advantages Of Front Terminal Batteries. Front terminal batteries have been in existence for quite some time now, originally designed for use in telecom cabinets the accessible design of these battery types has now been embraced by manufacturers and installers for use in many other standby power applications such as UPS and emergency lighting. This is due to the advantages given by utilising this type of solution, the benefits being hard to ignore. The following is a breakdown of some of the features of front terminal batteries, together with how this option can often prove to be practical and cost saving over the life of the battery system. All front terminals offer a strong power density and use their footprint with maximum power efficiency. This can solve on site issues where space is at a premium and fitment of batteries can be an issue, such as older office environments where building service and IT rooms can be limited but the requirement to support modern critical services remain. Space saving battery power solutions are a great advantage and can leave extra space for additional equipment which are an inevitable requirement as businesses expand within existing premises. 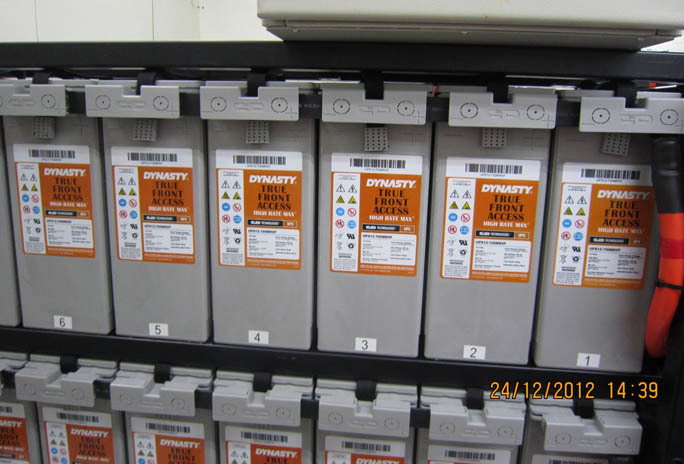 The image below shows front terminal batteries on an open rack as part of a major UPS installation, the efficient fitment capability of front terminal batteries provide a space conscious design. Notice that minimal clearance is needed over the top of the battery, whereas a top terminal battery would require space for cables and terminal access above each battery row. Installation of front terminal batteries into cabinets or racks tends to be very simple compared to top terminal battery products as, of course, the battery terminals will be facing the front of the battery rack or cabinet. This means all the terminals are easily reached and are connected in a row using just a small solid interconnecting bar, rather than varying lengths of cable or long solid bar connectors required for top terminal batteries. Specific layout designs for top terminal batteries can be quite complicated depending on the type of installation required, this is much less in the case of front terminal batteries where inter battery connection requires just one common link type on most occasions. 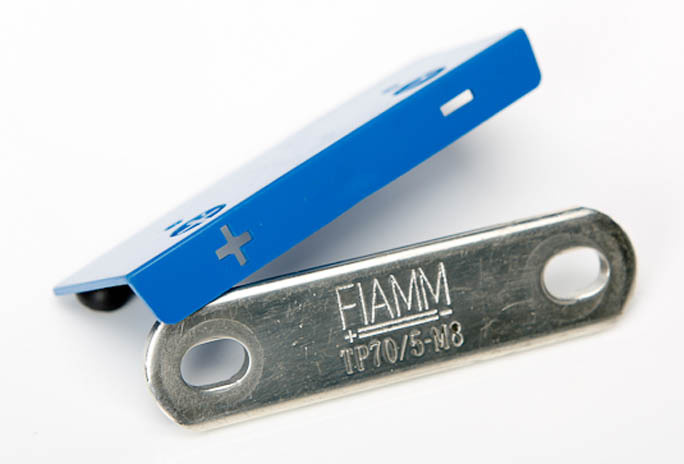 The Fiamm FIT range of front terminal batteries each come supplied with an inter-connection link and 'clip on cover' as shown in this image. Another considerable benefit to front terminal batteries is post installation maintenance. With this type of layout the accessibility of the live terminals is paramount for taking measurements from the system such as voltage and impedance required to ascertain the health of the installation. Taking these readings from easy to reach terminals is a great advantage and a major time saving feature when compared to top terminal batteries. In the event a battery should fail within a system and require replacement, then the front terminal battery offers a modular ‘slide out, slide in’ simplistic fitting as all batteries are situated at the front. Whereas if the same situation arises within a top terminal battery cabinet, then several batteries may have to be removed to reach the failed battery should it be locate at the rear of a cabinet. Reaching over the top of connected batteries within a cabinet to take measurements is not ideal. Front terminal batteries eliminate this disadvantage with the location of all inter connecting parts and terminals being easily and practically in reach. VRLA front terminal batteries are non spillable, non hazardous and generally safe for transport. The next image shows a system of UPS12-700MRXF from the C&D Technologies MRXF Range which demonstrates the accessibility of the terminals which are situated directly behind the clip on covers. The majority of this battery type employs traditional valve regulated lead acid technology (VRLA) with absorbed glass mat (AGM) separators. 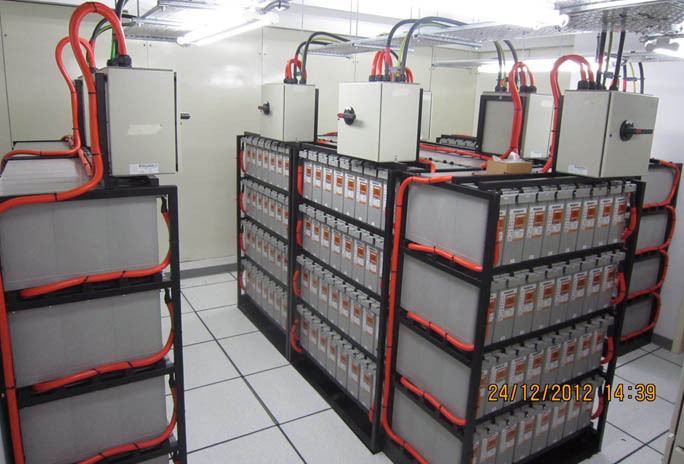 This is a long proven and highly reliable solution and is the most common battery chemistry used in industrial batteries for standby use, benefiting from many years of research and development to ensure an optimum, 'fit for purpose' product. OUR RANGE OF FRONT TERMINAL BATTERIES. Blue Box Batteries offer front terminal battery solutions from all major manufacturers such as Exide GNB, Fiamm, Yuasa and Enersys and have advocated using them in many applications which have proven this type to be the best option. To discuss the benefits of front terminal solutions further please contact our support team, we pride ourselves on our service, experience, technical knowledge and trusted position as a UK industrial battery distributor. Planté Battery Values – On float cell voltages, ohmic measurements & specific gravities. How Much Heat Does A Lead Acid Battery Generate? A Guide To VRLA Battery Discharge Testing. Comparing VRLA Battery Specification Standards.